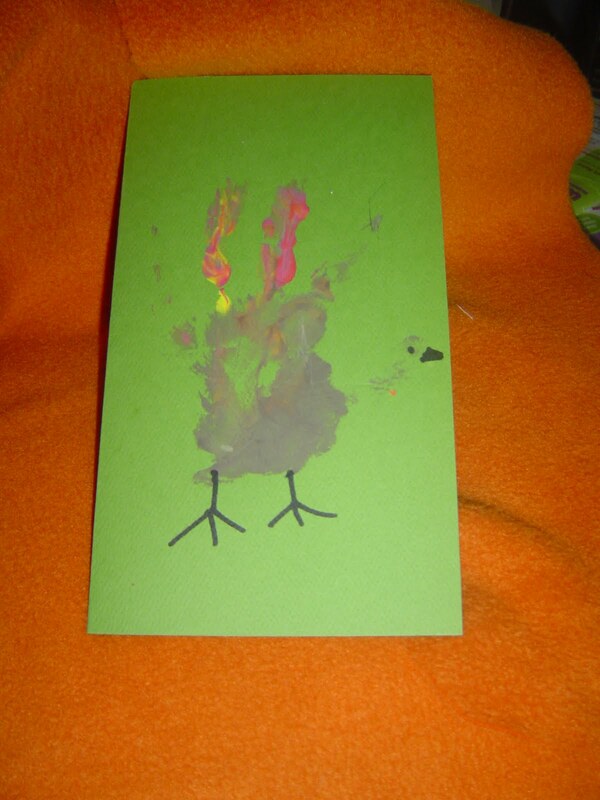 This is something we did last year around Thanksgiving and sent to the kids' birthparents and grandparents. We had much better ones that were mailed off to loved ones, but I found this card while I was cleaning. This was long before I started bloggingm so I don't remember what website it came from. We just used regular washable poster paints and mixed a couple colors together to make brown. We painted the palm and thumb of the hand with brown. Then painted the fingers red or yellow. We also ended up really liking the effect of painting the fingers both red and yellow at the same time, so they mixed together must a bit and gave it a little more dimension. Then we had the kids stamp their hand on the card. You'll want to make sure each finger makes full contact so you don't end up with some phantom feathers like we have here. 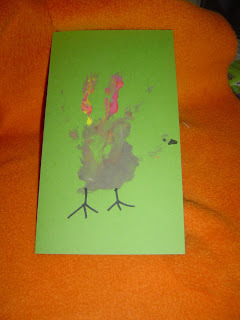 Once the paint had dried completely, we added the eye, beak, and feet with a Sharpie marker. Very cute idea and I'm sure the kids loved doing it!